We are in the process of finishing our sub basement. It has taken about 3 or so years. Needless to say we are ready for this project to over. We recently added carpet and finished painting. The TV is mounted on the wall and the furniture is ordered. We have to throw some baseboard and trim on and we'll call er done. Anyway all that to say, I am working from home today and here is my current work from home setup. Dell Vostro 230 workstation. Today's purpose is clock and jukebox. 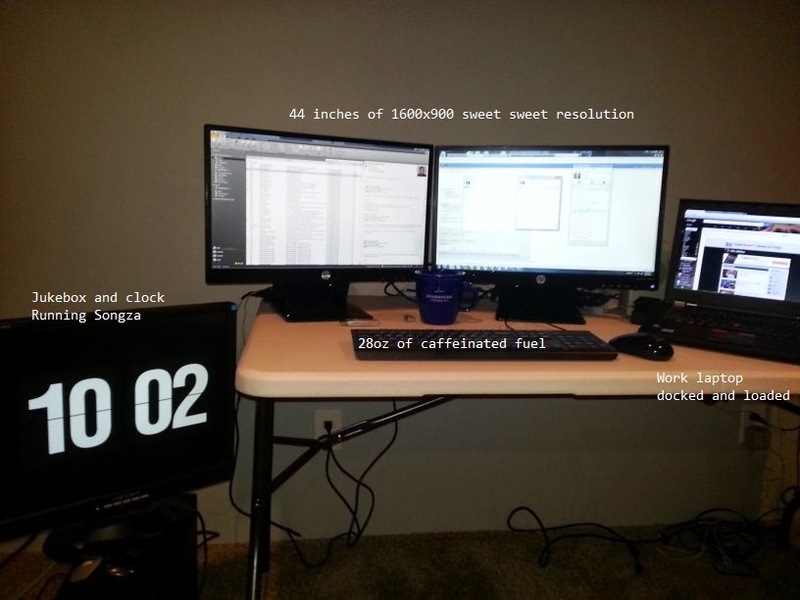 Typically this is the main workstation here in the bunker. Can't wait to get the computer desk and chair so I can get everything setup and cleaned up.Here is a quick instagram vid tour of the current status of the basement. 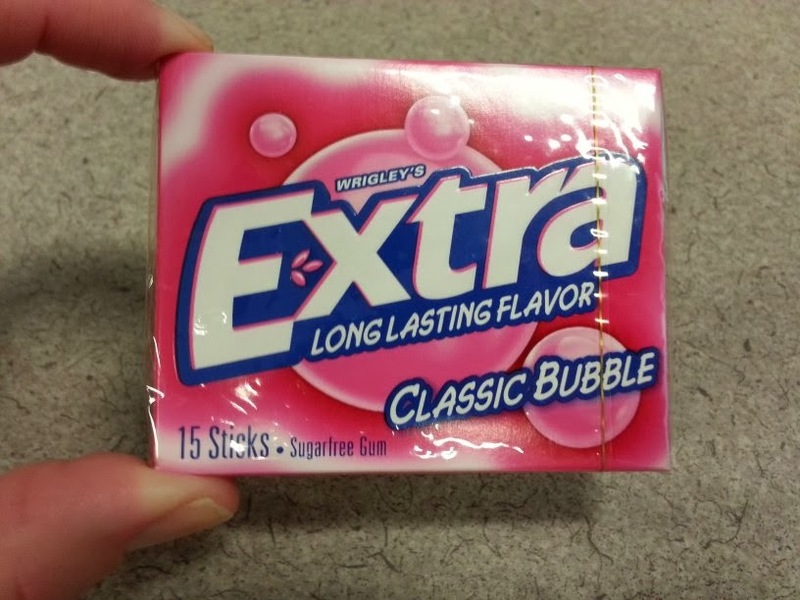 So me and a friend took a pack of Extra Classic Bubble for a spin to figure out exactly how long "Long Lasting Flavor" truly is. After 30 sticks we determined that "Long Last Flavor" equals exactly 17 minutes and 35 seconds. The instructions were simple, but you'd have to know my friend JB to know he would find a way to hose up this extremely precise scientific experiment. At least he is willing to go on those cooky data collection quests with me at times. The instructions were to chew the gum until it made you want to barf. Chew the entire pack (15 pieces) and track the start time and duration of every piece. Here is the data for Every piece. Below is a chart of each piece. Enjoy this chart of many colors for the AVG, MIN, MAX, STDDEV, and Correlation breakdowns. JB really burned through the gum, sometimes only chewing a piece for a minute. He later explained that his primary use for gum is to freshen his breath. Like I mentioned earlier, who needs instructions really. Extra Classic Bubble flavor does not last very long. 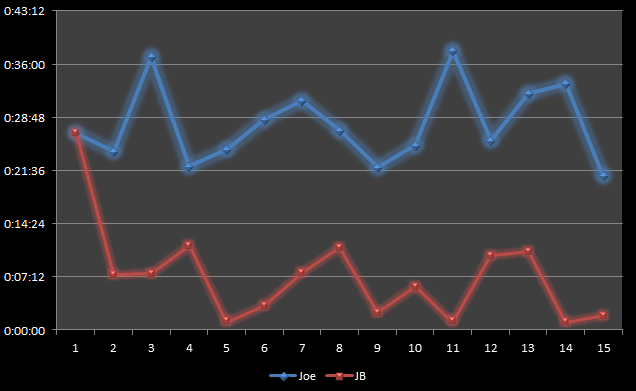 Friday was a popular day for Joe's gum chewing tests. JB preferred Wednesdays as the gum chewing test days of choice. In one final test I brought in 2 other testers to see how long we could chew a piece of Extra Classic Bubble. 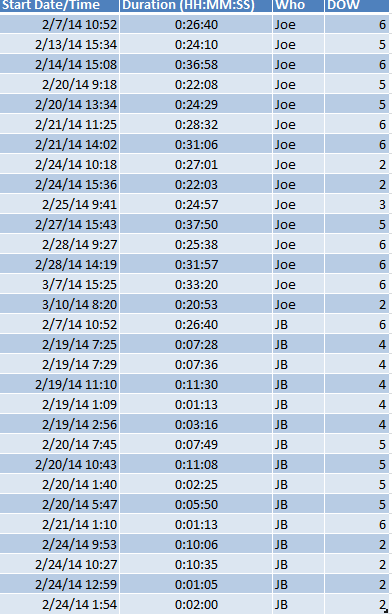 JB of course steps up to the challenge here and beats my time by about 19 minutes. Tester A came in second with a time of 3 hours 41 minutes. Tester M though is an animal. He turned in a time of 20 hours 20 minutes and 15 seconds earning him the Forrest Gumption Arbitrary Achievement for chewing a piece of Extra Classic Bubble that long. Took the wolf pack to Great Wolf Lodge last weekend for our annual winter swim vacation. Good times had by all. Before the trip I started thinking what data I could collect and measure during the trip. I settled on Lazy River Lap times, mainly because the data collection would not take a whole lot of effort and not impede the vacation time too much. Runs 12 and 13 were actually laps that I took in a tube letting the current do the work. Interesting that one lap took me 3 minutes and 32 seconds in the tube, while Lap 13 only took 2 minutes and 23 seconds in the tube. Run 12 I must have been behind some loafers with a blatant disregard of good Lazy River lap times. Sheesh people. I removed Run 12 and 13 in the chart below. This chart shows the laps where I was either swimming, walking, or a combo of both. The distance information about the Lazy River is not on the web site. After a quick chat with an online rep, they gave me the number to the local location to ask them. After about 4 rounds of sitting on hold waiting for someone to pick up, I finally talked to a nice lady who was a bit puzzled by my request. She did however ask around for an answer. She finally came back to the phone and gave me a guesstimate of 50 yards. I am not sure how accurate that is but it is really all I have to go on at the moment. Using the rough estimate on distance (150 feet) I came up with the following info. So there you have it. 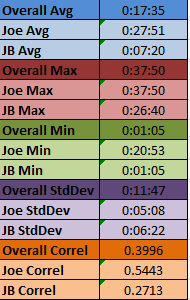 Lazy River Speed Runs 2014. There are a lot of variables here including loafers, number of kids hanging off of me, water temps, overall exhaustion level, etc. Its another data set to consume none the less.